Do you know a Laurier student who has made an incredible impact on the lives of other students through teaching? The Laurier Student Teaching Award of Excellence is your opportunity to recognize them for their contribution. Formerly the Teaching Assistant Award of Excellence, the revamped Laurier Student Teaching Award of Excellence is designed to recognize a wide range of students who demonstrate excellence through their teaching practice and positively impact the learning and development of Laurier students. “This award is an exciting opportunity for the entire Laurier community to nominate student teachers who have had a significant impact on enhancing student learning at Laurier,” says Joseph Beer, director of the Centre for Teaching Innovation and Excellence. The Laurier Student Teaching Award of Excellence has two categories: one for undergraduate students and one for graduate students. 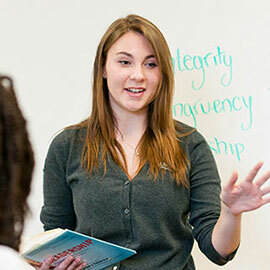 Nominees must communicate the intentionality in their actions and how their teaching approach impacts the learning experience of fellow students at Laurier. There is an open nomination period from Nov. 1 until Jan. 13 during which all students, faculty, and staff are invited to nominate a student who exemplifies teaching excellence at Laurier. Nominators will be asked to provide the nominee’s name, department, and briefly describe how the nominee’s teaching contributions have positively impacted student learning at Laurier while citing concrete examples. From the pre-nominations, a group of nominees who meet the award criteria will be selected and contacted by the Centre for Teaching Innovation and Excellence (CTIE) on Feb. 1, and asked to submit a complete teaching portfolio by March 1. Nominees will be supported by CTIE throughout the process of creating and submitting the teaching portfolio. Nominators can access more information about the Laurier Student Teaching Award of Excellence online.